I’m not going to lie, this post is going to be a pretty big stretch in terms of an archival link. BUT – I think this is important and is in keeping with the overall theme of the blog, which is to say, things I am fond(s) of. And, well…this is the only blog I have and I am dying to talk about this. Although it is not necessarily archives-related, this post is very much in keeping with Canada’s National Waste-Reduction Week, which runs from October 15 to 21, 2018. It is difficult to pinpoint, but often there is a moment where something clicks. You open your eyes and all of a sudden you can’t ignore it. You wonder how on earth you were ever not aware of it. This has been my experience over the past few months. I have the pleasure of working on the same floor as the city’s environmental services people and they talk about waste – a lot! 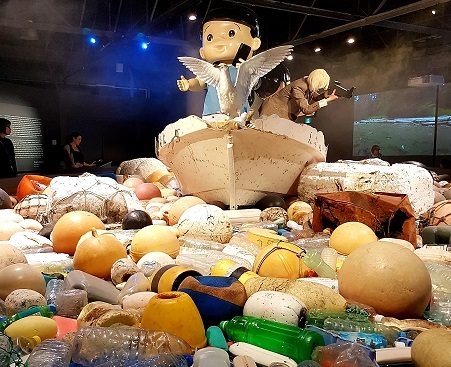 At an event earlier this summer, a few of us got to talking about what could be recycled in the various municipalities in British Columbia’s Lower Mainland region. I asked about shampoo bottles, noting that I wasn’t sure if they could be effectively recycled and that it seemed very wasteful. One of the girls mentioned that you could buy shampoo bars instead. It sounds really silly, but this was a revelation for me. This simple conversation was what it took to wake me up to the disastrous effects of plastic. Here’s where I started thanks to my colleague. I thought this one would be easy, but it proved challenging given how sensitive my hair turned out to be. My colleague tipped me off to the fact that Lush sells a range of shampoo and conditioner bars, so this is where I began my product testing. I had always avoided Lush because I am pretty sensitive to strong perfume smells, but I decided to breathe through my mouth and brave the store. The staff was incredibly helpful and talked me through the type of bar that would work best for my hair (very thin and straight). I went with the “Seanik” shampoo bar and the “Big” conditioner bar. You can also buy tins to keep the bars in that are made of metal that won’t rust in the shower. The shampoo bar lathers up nicely but the conditioner bar was more of a challenge. I ended up giving up on “Big” and switching to “Jungle” which is a little easier to apply without rubbing it directly on your hair, which I am not crazy about. I was pretty happy with this new set up until I started looking into the ingredients of the bars. My initial focus had been simply eliminating the plastic packaging, but the logical progression was towards natural ingredients as well. There are problematic reports about sodium lauryl sulphate (SLS), which is used in the Seanik shampoo bar, so I decided to find a more natural alternative. I landed on bars from Unwrapped Life. They do a range of bars for different hair types and they even have a non-scented one, which is appealing to me. However, the shampoo bar uses sodium coco sulfate, which some people have argued is almost as problematic as SLS. So…the hunt continued. I tried J.R. Liggett’s shampoo bar, since it doesn’t contain sulphates, but it left my hair super greasy. This might be a good bet for someone with really dry hair but it definitely wasn’t for me. In the end, I couldn’t stick with the conditioner bars. When the weather turned colder and I began to dry my hair regularly, I turned into a giant ball of static and it drove me crazy! I A/B tested different combinations of shampoo and conditioner to figure out exactly what was causing the static and I figured out that it was the conditioner bars. 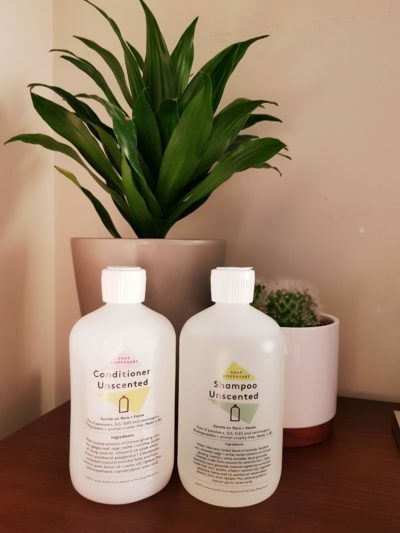 I think I might use a bar conditioner while travelling, but I finally landed on the permanent solution for my hair when I tried the unscented liquid shampoo and conditioner from a local no-waste store that we have in Vancouver called the The Soap Dispensary. I have had static-free success with their natural, SLS-free unscented liquid conditioner and their shampoo leaves my hair grease-free and silky-smooth. The best part is that they are both paraben-free, SLS and SLES-free, and cruelty-free. Yes, the bottles are plastic, but they are refillable, so no waste. You could also choose to use a refillable glass jar but I wasn’t crazy about the idea of having glass in the shower. My hair is happy and my desire to eliminate single-use or temporary use plastic is satisfied. Hopefully there are similar products in a no-waste store near you. I think the key takeaway from the shampoo and conditioner hunt is that every person will be different and you will likely have to try a number of products before you find the one that works best for you. This one worried me the most. I have been using Dove antiperspirant forever and I was really scared to switch to anything different. I was afraid I would end up smelling and people would start avoiding me. Turns out, this one was the easiest to solve (and the cheapest!). I briefly tried the Lush “Aromaco” deodorant bar but it was so rough to apply, didn’t last, and I didn’t like the patchouli smell. I abandoned that one after a day. Luckily, the second product I tried was an immediate winner. 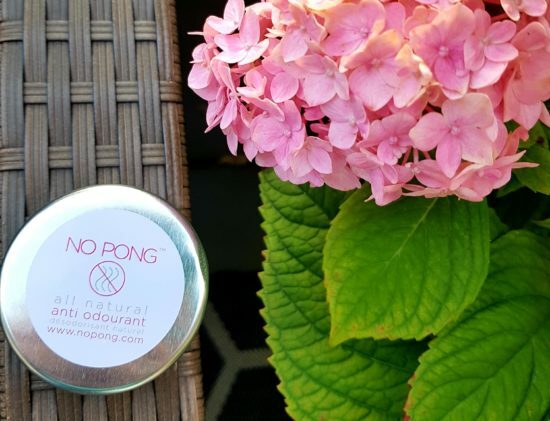 No Pong was developed by a couple in Australia (read about their story here) who were looking for an effective, natural product that wouldn’t cost a fortune. In 2018, they began manufacturing and selling in Canada as well. There are no Canadian retailers yet, but you can order it online and the shipping cost is incredibly reasonable ($2.95). I cannot say enough good things about this product. I have been using it for over a month now and I LOVE it! It feels nice, is incredibly effective, and is reasonably priced (one tin costs $5.95 and will last me about two months). There is absolutely no plastic packaging. The product ships in a paper envelope and the label is laser-printed directly on the tin, so no adhesives. Don’t be put off by the fact that you have to apply it with your fingers because you get used to that within a day. This one is such a winner on all fronts! Finding a non-plastic toothpaste that doesn’t taste awful was a bit of a challenge. I tried a number of products and I managed to find some that were certainly tolerable, if not particularly enjoyable. When I got started on this journey, one of the first alternatives I read about was toothpaste bits. 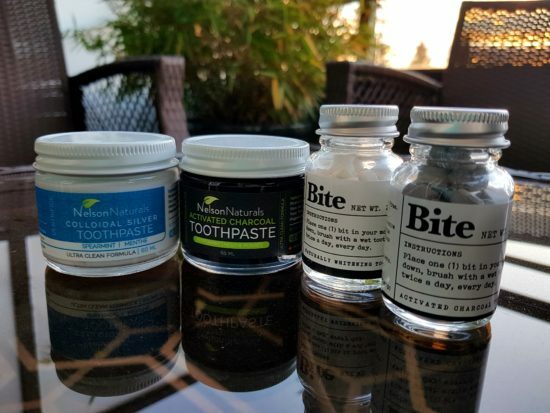 The first ones I found were Lindsay McCormick’s Bite Toothpaste Bits, which are very much in line with the plastic-free, natural agenda. You chew it and the bit turns into a foamy toothpaste. The bits come in a glass jar with a metal lid and the refills are sent in paper packaging. It took quite a while to get my order but the company explained that they have been struggling to fill orders since the product got some national media attention. I was a little concerned when I read that it contained sodium lauryl sulphoacetate, but I read up on it and it seems like this is not its more evil sulphate cousin and is not a problem. They taste ok (bit of an aftertaste) but I determined that these wouldn’t be a sustainable option for me, because when you factor in shipping costs and the exchange rate, they end up being quite expensive. While I waited for the Bite bits to arrive, I tried some alternatives. I first tried some other toothpaste bits to see if I would like the format. I tried the Lush version called “Toothy Tabs,” but I hated the flavours and they recently switched the packaging from paper to plastic, so they weren’t a sustainable option. I then tried Nelson Naturals toothpaste. It comes in a glass jar with a metal lid, so plastic is eliminated. Some stores that carry it have plastic around the lid to keep it closed but a no-waste store near me (Nada Grocery) sells it without the plastic ring. I like that it uses natural ingredients and that the product is made in Canada. They also have a guarantee that promises to refund your money if you don’t like the product. I have tried the Activated Charcoal, which turns your mouth all black while you brush (actually kind of fun) and the Spearmint. I have heard great reviews about the natural whitening effects. The taste is pretty decent, but it is quite salty given the use of sea salt as a preservative. I suspect I could get used to the salty taste. There are a number of flavours and they seem to be carried in a lot of stores. The best thing about this product is that many stores will actually refill the jars so this product would have the least waste of anything I have tried so far. I really wanted to love this product and I really wanted it to work for me. Alas, within a week of using it, my teeth were crazy sensitive. I have been using Sensodyne for years and it has really helped with my tooth sensitivity. I really wanted this one to work but, unfortunately, I think I have to bite the bullet (pun intended) and stick with the plastic packaging, as much as it pains me to do so. The toothbrush situation is one that has me a bit puzzled. I have been using the same electric toothbrush for at least ten years and I feel that you get a much better cleaning with an electric toothbrush. However, I acknowledge that the replacement heads are plastic and over the ten years, that’s a lot of heads. Up until very recently, I had not been able to find a non-plastic electric equivalent other than the silicone Issa, which costs a fortune. Quip offers an electric toothbrush with a metal handle, but the heads are still plastic, so that doesn’t help. All is not lost though, as I have recently learned about the Goodwell Company’s line of toothbrushes and they may be the best option. They are about to release the BE toothbrush which has 100% biodegradable brush heads and uses kinetic energy rather than electricity or batteries. It is currently available for pre-purchase at half price and will be released in December, so I think I will give it a go. As for floss, I had already purchased a tonne of the plastic flossers, which are so easy to use that I actually floss every day. However, once those have been used up I will be switching to Dental Lace, which is biodegradable and comes in a refillable glass jar with a metal lid. This company is also continuously seeking better, more sustainable ways to make their floss, which is great! There is a great review of dental floss options here if you want more info. Finding non-plastic alternatives in the makeup world is REALLY hard. You will find loads of companies that are making cruelty free, vegan, gluten free, fragrance free, paraben free, etc. products, but I have yet to find a company that is focusing on eliminating plastic from their packaging. I don’t use a lot of makeup so there were only a couple of products I needed to focus on. Luckily, after a lot of online research, I managed to find a foundation that I am pretty happy with. Sweet LeiLani foundation comes in a glass bottle, with a metal lid, in a cardboard box. I also like that they stock it in my local supermarket, which eliminates shipping packaging and shipping costs. Some of their other products (powders, eye shadows) also come in plastic-free packaging, so they seem like a good option. Unfortunately, I have yet to find an eye liner pencil without plastic. I thought that would be easy, but no luck so far. If anyone knows of a good, easy-to-apply eye liner that is plastic free, then I am all ears! I am not super jazzed about the idea of putting eye liner on with a brush, so I would really like to find a pencil option. In terms of taking the makeup off, I struggled to find a makeup remover that was effective and plastic-free. 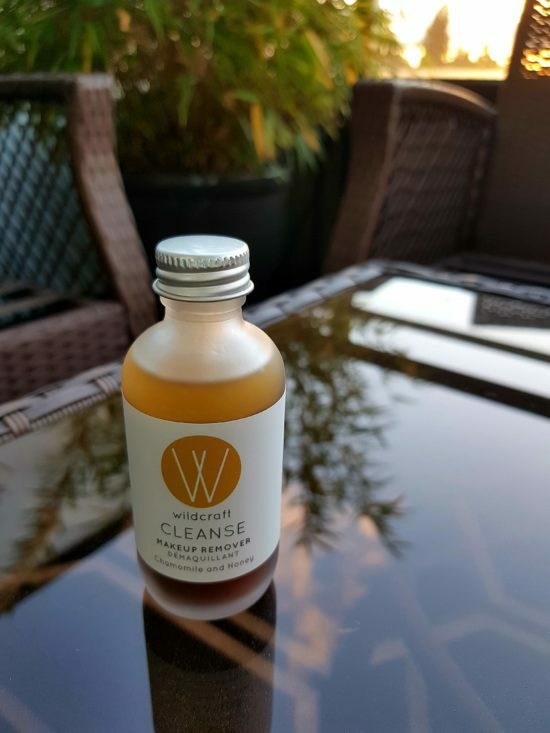 So far, I am really happy with the Cleanse product from Wildcraft, which is a Canadian company out of Toronto. It smells lovely (like honey) and takes off my eye liner pretty easily. My one hesitation with this product was that it has a plastic orifice reducer to ensure you don’t use too much. I contacted the company and they offered to make me a bottle without the plastic. I thought this was really great customer service and just goes to show that you can have agency in the buying process. The only downside to this is that I now have to buy it online and pay for shipping, even though it is stocked in a store close to me. It did ship without any plastic (other than tape) but I guess I have to weigh up the small amount of plastic of the product I could get in store with the carbon footprint of the plastic-free shipping. I bought some reusable bamboo cloths from Ola Bamboo to use with the makeup remover. They come in a lovely bamboo box and have a little laundry bag to put them in for washing. They are a bit rough, but manageable. This is also a company that sells bamboo toothbrushes, if you’re into that. Shaving may yet be another area where I decide I can’t hack the plastic-free life, but I am still soldiering on for the moment. 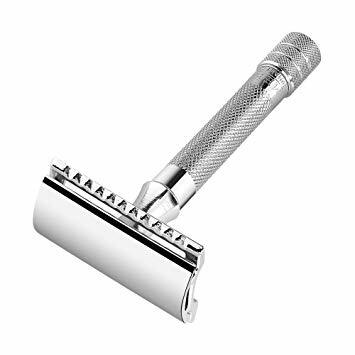 I decided to switch to a metal double-edged safety razor and bought a pretty standard one. It seems that you can pay anywhere for $20 to $200 for these razors, but I have read that you can also find them in antique stores, as the design has not changed in many years. The metal blades last only about 3-4 shaves before they start catching, so replacing blades is a much more frequent task. Also, the first time I used the razor I cut my legs pretty badly. You definitely have to be WAY more careful and make sure that the angle is right. I mostly have the hang of it now, but I am finding that it is causing a bit of anxiety and so I am shaving less often – not ideal. I will stick with this for a few more months to see if I can get the hang of it. I really do want to make this one work! As for shaving foam/gel/soap…I have found that a good moisture-rich soap works just fine with this razor so no need for any fancy products. One less thing to research. Phew! Here’s where my plan has completely fallen down. Save for getting laser eye surgery and eliminating the need for glasses and contacts altogether, I have resigned myself that this is just an area where I can’t compromise. I really hate wearing glasses so I am not willing to give up my contact lenses. Unfortunately, there are no non-plastic contact lens solutions that I have found and the enclosures for the lenses also use plastic. Oh and the lenses themselves are plastic. Sorry nature 🙁 I am super blind and don’t have the money right now for surgery. And, let’s be honest, I am pretty scared of eye surgery. Until I pluck up the courage and save the cash, I will just have to be very careful to recycle all of the above. 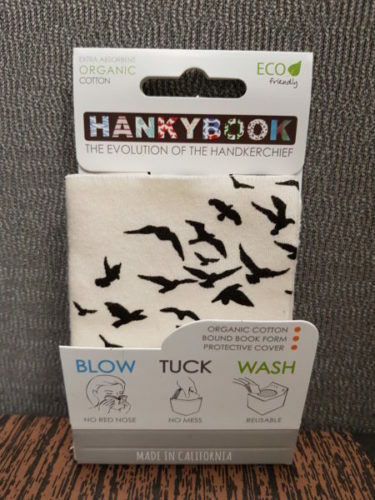 Although only semi plastic-related, in that most Kleenex boxes come with a plastic cover, I have also recently tried the HankyBook, which is an eco-friendly alternative to using Kleenex. I was pretty skeptical about this but I bought one to try it out and I actually really like it. It is a little book of soft cotton pages that you can use to blow your nose and then you just flip to the next page and once you have used the book up, you throw it in the laundry. Not sure that it will totally replace Kleenex in my life, but I thought it was worth a try and they come in all kinds of cute patterns, so that’s fun! It is also really convenient to throw in a purse or have in a desk drawer at work. I know that one person changing up their routine is a drop in the bucket, but one person becomes two, becomes ten, and eventually changes can be made and pressure can be put on manufacturers. This journey has been enlightening and frankly, it’s been fun (when I wasn’t overwhelmed by the issue). I am still not completely satisfied with all of the changes, so I will keep working on it until I have eliminated as much plastic as I can from my daily routine. I will also have to accept that I won’t be able to eliminate plastic entirely – not yet, anyway. Hopefully more manufacturers will clue in on the disastrous effects of plastics and seek alternative packaging options so it won’t be so difficult to find eco-friendly options. In the meantime, I am going to widen my search outside of the bathroom to see where I can also make some changes. Thank you for indulging my totally-unrelated-to-archives blog post. Hopefully this wasn’t too preachy – not my intention at all. I just wanted to share what I have learned over the past few months. I will keep trying new products to find the best combination of no-waste packaging and effectiveness. Please get in touch if you have any plastic-free products you are excited about.